Numbers carry meaning. I was reminded of this when thinking about the holiday of Shavuot—which begins tonight—and after listening to a fascinating presentation by superstar activist Rye Barcott. Rye, age 32, ex-marine, activist and entrepreneur, showed up to the AJWS office last week to talk about his organization (and AJWS’s grantee), Carolina for Kibera (CFK). We’ve blogged about CFK before, and it’s an organization that does incredible work with the youth of Kibera, Kenya. CFK facilitates sports programs, adolescent girls’ education, HIV counseling, community service initiatives, and a 24-hour medical clinic. Rye’s book opens and closes with a woman named Tabitha Atieno Festo—a single mother and unpaid nurse—who asked to borrow $26 from Rye to start a small business selling vegetables. Though Rye had decided not to give small gifts to members the community, noting that more often than not, small gifts did very little to help and could cause more harm than good, it seemed Tabitha had a good plan. And, as Rye puts it, “What did I have to lose?” So he fronted the money. Essentially, the Power of 26 is the potential we all have to create incredible change with the right investments in the right places. A small amount of money in the hands of remarkable leadership and good will has gone a long way. The Tabitha Clinic, as it is now called, operates 24 hours a day and serves over 40,000 patients a year. 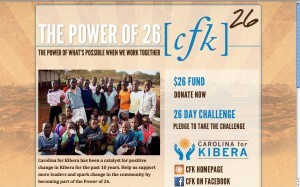 So, CFK has given the number 26 a franchise. I can donate $26 (or, I imagine, some multiple thereof). I can take the “26-day challenge,” devoting each of 26 days to understanding more about Kibera through community service and experiential learning. And Rye’s book tour is looking to hit exactly 26 cities. This type of number-happy system for getting involved should sound familiar to many American Jews. How many times have we been solicited for donations in multiples of $18, the numerical value* for the Hebrew word “chai,” or “life”? Rattling off multiples of 18 was among my earliest math skills (come on, join in with me: “18, 36, 54, 72…”). But no major Jewish holiday emphasizes counting more than Shavuot. The name itself translates to “weeks”—referring to the 7 weeks, or 49 days, traditionally counted between Passover and Shavuot. Seven weeks—like the 7 days of creation—and Shavuot is on the 50th day—like the jubilee year of liberation. We discuss the 3 days of preparation for Mount Sinai, relive the 40 days and nights at the mountain and the giving of the 10 (or, for some communities, 613) commandments, consider measurements and tithes associated with the harvest season, and count the hours until morning. Twenty-six, I should note, has Jewish mystical significance as well. It is the numerical value* of a primary name of God—YHWH (Yahweh or Jehovah)—and has received great meditative attention by Kabbalists and modern mystics. The “numbers game,” however, isn’t really a game at all. It is a way of ordering, of signifying, of creating meaning. Ritual practice is replete with numbers to no end, and for good reason. They give a sense of stability and discipline, quantifying that which can feel hazy. Timelines realize projects. Prices approximate value. Statistics focus perceptions. Age signifies life stages. Birthdays celebrate people. And just recently, Harold Camping felt compelled to put a date even on the end of the world—a prediction borne of biblical calculations and the special religious significance of the numbers 5, 10, and 17. In light of Carolina for Kibera’s program, however, I would like to propose that we think of numbers more proactively in this upcoming holiday of counting. In what ways do numbers shape our lives and our actions? How can we use our penchant for order to build systematically towards a better future? And how do we continue to create personal meaning through actions which may feel like mere quantities of money or time? If the Power of 26 is, as CFK writes, “the power of what’s possible when we work together,” then what is the power of 7, 40, 6.92 billion, 14.7 trillion, or—maybe most importantly—1?